The Book of Ezekiel is the third of the Major Prophets in the Tanakh and one of the major prophetic books in the Old Testament, following Isaiah and Jeremiah. According to the book itself, it records seven visions of the prophet Ezekiel, exiled in Babylon, during the 22 years 593-571 BCE, although it is the product of a long and complex history and does not necessarily preserve the very words of the prophet. The visions, and the book, are structured around three themes: (1) Judgment on Israel (chapters 1–24); (2) Judgment on the nations (chapters 25–32); and (3) Future blessings for Israel (chapters 33–48). Its themes include the concepts of the presence of God, purity, Israel as a divine community, and individual responsibility to God. Its later influence has included the development of mystical and apocalyptic traditions in Second Temple and rabbinic Judaism and Christianity. The book opens with a vision of YHWH (יהוה), one of the Names of God; moves on to anticipate the destruction of Jerusalem and the Temple, explains this as God's punishment, and closes with the promise of a new beginning and a new Temple. Judgment on Jerusalem and Judah (Ezekiel 4:1–24:27) and on the nations (Ezekiel 25:1–32:32): God warns of the certain destruction of Jerusalem and of the devastation of the nations that have troubled his people: the Ammonites, Moabites, Edomites and Philistines, the Phoenician cities of Tyre and Sidon, and Egypt. 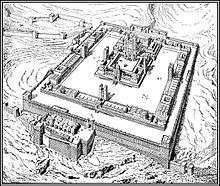 Building a new city (Ezekiel 33:1–48:35): The Jewish exile will come to an end, a new city and new Temple will be built, and the Israelites will be gathered and blessed as never before. The Book of Ezekiel describes itself as the words of the Ezekiel ben-Buzi, a priest living in exile in the city of Babylon between 593 and 571 BCE. Most scholars today accept the basic authenticity of the book, but see in it significant additions by a "school" of later followers of the original prophet. While the book exhibits considerable unity and probably reflects much of the historic Ezekiel, it is the product of a long and complex history and does not necessarily preserve the very words of the prophet. According to the book that bears his name, Ezekiel ben-Buzi was born into a priestly family of Jerusalem c.623 BCE, during the reign of the reforming king Josiah. Prior to this time, Judah had been a vassal of the Assyrian empire, but the rapid decline of Assyria after c.630 led Josiah to assert his independence and institute a religious reform stressing loyalty to Yahweh, the national God of Israel. Josiah was killed in 609 and Judah became a vassal of the new regional power, the Neo-Babylonian empire. In 597, following a rebellion against Babylon, Ezekiel was among the large group of Judeans taken into captivity by the Babylonians. He appears to have spent the rest of his life in Mesopotamia. A further deportation of Jews from Jerusalem to Babylon occurred in 586 when a second unsuccessful rebellion resulted in the destruction of the city and its Temple and the exile of the remaining elements of the royal court, including the last scribes and priests. The various dates given in the book suggest that Ezekiel was 25 when he went into exile, 30 when he received his prophetic call, and 52 at the time of the last vision c.571. 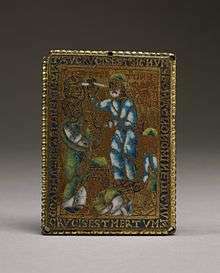 The first half of the 20th century saw several attempts to deny the authorship and authenticity of the book, with scholars such as C.C. Torrey (1863–1956) and Morton Smith placing it variously in the 3rd century BCE and in the 8th/7th. The pendulum swung back in the post-war period, with an increasing acceptance of the book's essential unity and historical placement in the Exile. The most influential modern scholarly work on Ezekiel, Walther Zimmerli's two-volume commentary, appeared in German in 1969 and in English in 1979 and 1983. Zimmerli traces the process by which Ezekiel's oracles were delivered orally and transformed into a written text by the prophet and his followers through a process of ongoing re-writing and re-interpretation. He isolates the oracles and speeches behind the present text, and traces Ezekiel's interaction with a mass of mythological, legendary and literary material as he developed his insights into Yahweh's purposes during the period of destruction and exile. Ezekiel's imagery provided much of the basis for the Second Temple mystical tradition in which the visionary ascended through the Seven Heavens in order to experience the presence of God and understand his actions and intentions. 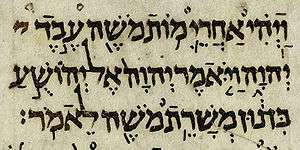 The book's literary influence can be seen in the later apocalyptic writings of Daniel and Zechariah. He is specifically mentioned by Ben Sirah (a writer of the Hellenistic period who listed the "great sages" of Israel) and 4 Maccabees (1st century AD). In the 1st century AD the historian Josephus said that the prophet wrote two books: he may have had in mind the Apocryphon of Ezekiel, a 1st-century BCE text that expands on the doctrine of resurrection. Ezekiel appears only briefly in the Dead Sea Scrolls, but his influence there was profound, most notably in the Temple Scroll with its temple plans, and the defence of the Zadokite priesthood in the Damascus Document. There was apparently some question concerning the inclusion of Ezekiel in the canon of scripture, since it is frequently at odds with the Torah (the five "Books of Moses" which are foundational to Judaism). 1 2 3 Sweeney 1998, p. 88. 1 2 Joyce 2009, p. 16. ↑ Petersen 2002, p. 140. ↑ McKeating 1993, p. 15. ↑ Blenkinsopp 1996, p. 8. ↑ Drinkard 1995, pp. 160–161. ↑ Sweeney 1998, pp. 165–166. ↑ Sweeney 1998, pp. 91–91. 1 2 Sweeney 1998, p. 92. ↑ Sweeney 1998, pp. 92–93. 1 2 3 Sweeney 1998, p. 93. ↑ Goldingay 2003, p. 624. ↑ Sweeney 1998, pp. 93–94. ↑ Kugler & Hartin 2009, pp. 261–261. ↑ Block 1997, p. 43. ↑ Buitenwerf 2007, p. 165. ↑ Buitenwerf 2007, p. 165 ff. ↑ Block 1998, p. 502. ↑ Muddiman 2007, p. 137. Buitenfwerf, Riuewerd (2007). "The Gog and Magog Tradition in Ezekiel 20:8". In De Jonge, H.J. ; Tromp, Johannes. The Book of Ezekiel and Its Influence. Ashgate Publishing. Goldingay, John A. (2003). "Ezekiel". In James D. G. Dunn, John William Rogerson. Eerdmans Bible Commentary. Eerdmans. ISBN 9780802837110. Muddiman, John (2007). "The So-Called Bridal Bath...". In De Jonge, H.J. ; Tromp, Johannes. The Book of Ezekiel and Its Influence. Ashgate Publishing.